DataLight, a company performing an in-depth analysis of all crypto-related information, has recently published their new findings that show top best-performing Ethereum tokens by amount of transactions. KickCoin (KICK), the token behind a Blockchain-based crowdfunding platform KICKICO, is in the first place with 28,203. The token is currently sitting at the 352nd place on CoinMarketCap with a minor two percent price spike over the last 24 hours. 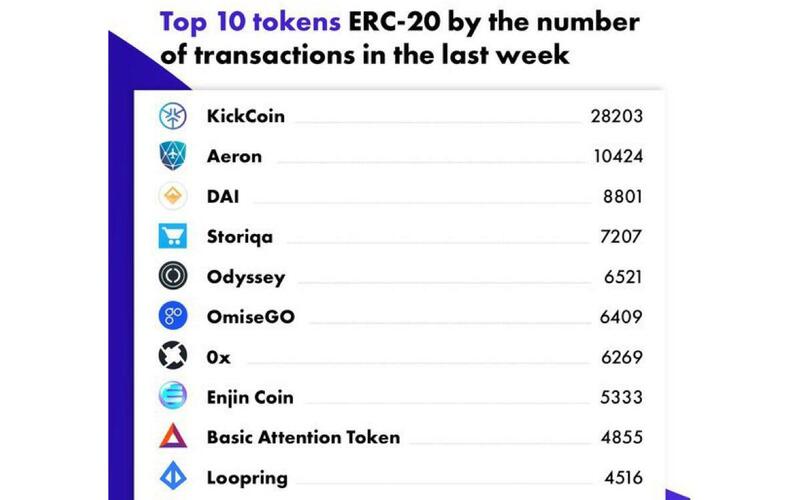 Aeron (ARN) and Dai (DAI) can also boast the highest numbers among ERC-20 tokens. Over the last week, they were involved in 10,424 and 8,801 transactions respectively. Storiqa (7207), Odyssey (6521) and OmiseGO (6409) are among other top 5 entrances. 0x (ZRX), the most popular cryptocurrency with GitHub developers, also made an appearance on the list with 6,269. Meanwhile, Enjin Coin (ENJ), which helps to create the first gaming multiverse on the Ethereum Blockchain, recorded 5,333 transactions.